The Galaxy Note 9 has been released and while it’s Gear VR-ready, Samsung didn’t announce a new virtual reality headset with the device. Given that the dimensions are slightly different compared to the Galaxy Note 8, the new flagship doesn’t exactly fit into the Gear VR with Controller that Samsung launched last year. So how will you go about experiencing virtual reality on your brand new Samsung flagship? Samsung will actually send you an adapter free of charge that you can use with the existing Gear VR so that the Galaxy Note 9 fits in it. The current iteration of the Gear VR headset (SM-R325N) was launched last year. It’s compatible with devices like the Galaxy Note 8, Galaxy S9 and others. Samsung hasn’t launched a new headset with the Galaxy Note 9 because there’s no need to. The adapter is all that’s required to make the Galaxy Note 9 fit into the existing headset. Some Galaxy Note 9 owners who weren’t aware have already resorted to more drastic measures. They have used a Dremel tool or sandpaper to trim the edges of the headset. There’s really no need to do that, though, if you’re looking for ways on how to use Galaxy Note 9 with Gear VR. Galaxy Note 9 owners can get an adapter shipped to them for free by reaching out to customer support. Customers in the U.S. can call the company at 1-800-SAMSUNG and request an adapter. The same can also be done through the live chat option in the Samsung+ app. Owners in other markets can also reach out to the company’s support and get the adapter. Samsung does mention that it may take up to two weeks for the adapter to ship. The company is evidently not going to launch a new iteration of the Gear VR this year which will eliminate the need to use an adapter. We may not get a new Gear VR until next year when Samsung releases its 10th anniversary flagship. 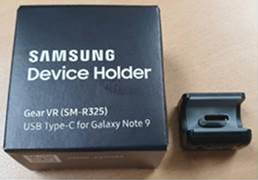 Update: Here’s an image of the adapter that Samsung is sending out to Galaxy Note 9 owners for the Gear VR. The S9+ struggles to fit in the Gear VR controller edition one, the only way I can get it out of the headset is to unlock the adapter and slide it out that way. (replacing the adapter after removing the phone). They should just move on to stand alone VR headsets instead. and have the phone be the controller – much easier that way. Yesterday called the helpdesk of Samsung in the Netherlands. First they claim it does not exist. Then after showing them their own webpage they admit it should exist but they do not have it. And they do not know when they will have it. I should check the store page… But I do not believe it will be available there. Could someone in Samsung Netherlands who is reading this react? PSA for everyone thinking of calling in to request this: Samsung won’t issue it without the phone’s IMEI number, which means you have actually have the Note9 in hand before you can get the adapter. Here in the Philippines, I was able to purchase one with an included USB type C adapter in the box, the phone fits just exactly so I am not exactly sure if there is another adapter that gives the phone more space when you use it or not. It is also surprising to hear from the customer representative that instead of advising them that there will be an adapter provided, they were told a different Gear VR would be released for the note9. I am very curious to see the adapter they will be giving out. Is someone do the request in France ? And where ? A picture of the adapter would’ve been nice. I’m curious how an adapter would fix the problem. Thanks for the picture. Is there a part number we can give to our customer service ? Cause now its not easy to make them understand what we want.